4. 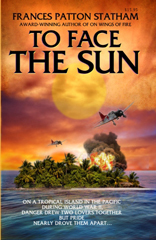 To Face the Sun, the 4th book in the series, shows World War II in the Pacific. Kenna and her husband, Brig. General Fitzpatrick, who is on MacArthur’s staff, are in Australia. Their son Jack is in the navy, and their daughter, Amanda “Sunny” Fitzpatrick, is a nurse on a hospital ship, that picks up the wounded from the various islands in the Pacific. When the ship is sunk, Sunny winds up on a dangerous island in the Solomons with the coastal watcher, Alex Ramsay, the British marquess of Dalhousie.